However, even if there is an unlimited potential demand for Christianity, there are still barriers to church growth that occur from the way the church goes about its mission. Specifically, growth is limited by the church’s inability to generate the resources needed for growth. Physical resources such as the attractiveness and functionality of the church buildings, and their capacity. Human resources, such as pastoral staff, lay leaders of Sunday Schools, housegroups. Programmes such as marriage preparation, bereavement follow up, social engagement in the community. Social Networks such as friendships and interactions in the church, opportunities to serve and make a contribution. Sense of belonging. Social, religious and spiritual capital. The model contains two variables, called stocks: Church represents the numbers attending church; Resource: represents all the resources that enhance growth. The central hypotheses are that church generates resources according to its size, and the resource in turn enhances recruitment to the church. This is the reinforcing feedback loop R in figure 1, where the two stocks are shown as rectangles. 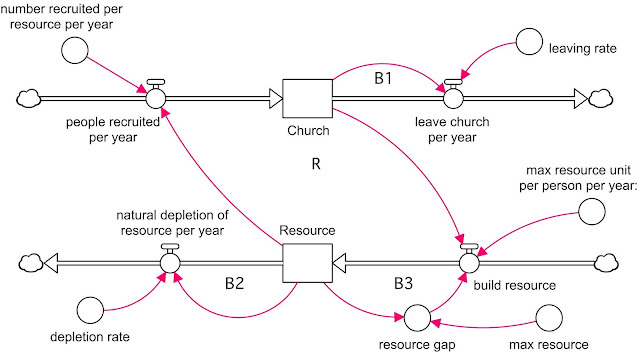 Opposing this is the balancing feedback loop B1 where I have assumed people leave church at a constant per capita rate. The stock Resource is a soft variable, one that has meaning but is hard to quantify . 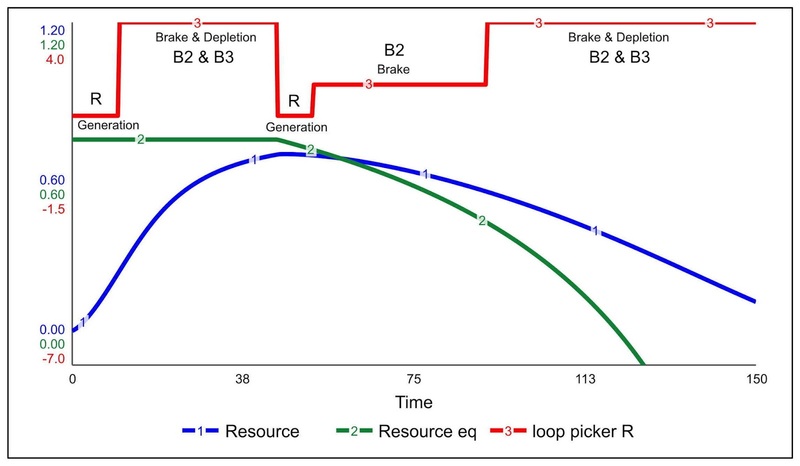 If it is not being generated then there is a natural depletion process, loop B2. Just think if people do not try to maintain housegroups, evangelism courses, Sunday Schools, buildings, friendships etc., then they will become less effective and get smaller. The key dynamic with resources is that as they get larger they become harder to increase further. For example a large number of housegroups are harder to manage and replicate. More people are harder to keep track of pastorally. Larger teams of people need more attention. There is a limit to how many friends you can have. All these effects are captured in the balancing loop B3, which can be thought of as a “brake” on resource generation. Easy to start off, but increasingly more difficult to keep growing . Resource is easier to measure if you think of a maximum possible resource. That is whatever the number of groups, buildings etc, it has reached its maximum effectiveness. This maximum is set at unity, which means 100% effectiveness for the resource. Consider a church of initially 10 people with a total leaving rate of 6% per year, including deaths. Church members are assumed to be very effective at building the resource, enabling growth at 19 recruits per year per resource unit. However the resource starts low, at 12% of capacity, due to the small size of the church. The resource is an easily depletable one at 50% per year. It is built at a rate of 0.0075 per person per year, assuming there is no resistance to building from the resource itself. Such a highly effective church grows over 60 years to get near its equilibrium value of 250. 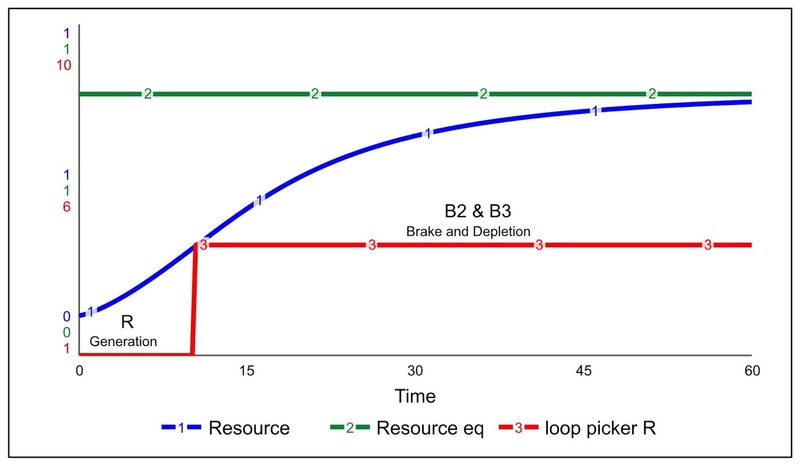 This is an upper limit that becomes increasingly harder to approach due to the difficulty in generating the resource, figure 2, curve 1. 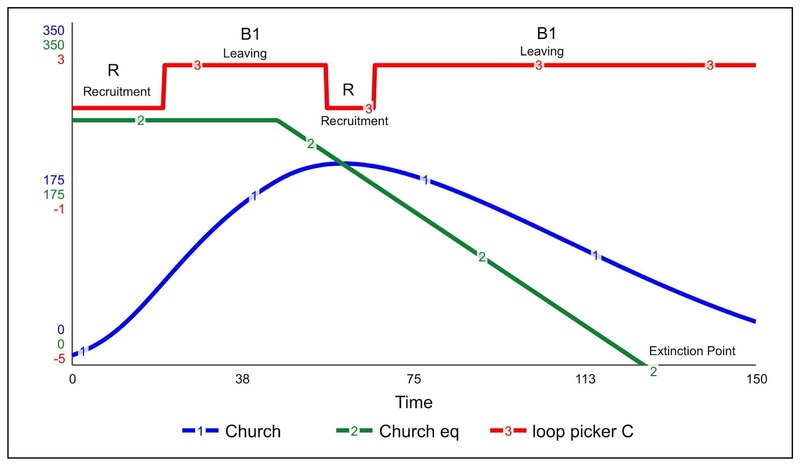 Initially the growth of the church (curve 1, figure 2) accelerates as the recruitment loop R has the strongest impact on the church. The loop with most impact is indicated by line 3 . By time 20 this impact has fallen so that the leaving loop dominates. Church growth now slows. The slowing period is much longer than the acceleration period and occurs when the church is well below its final equilibrium value. Thus most growth is slowing growth, not accelerating, because of the difficulty of making resources more effective. 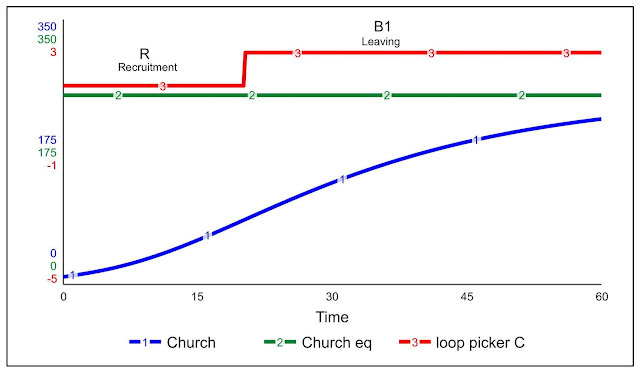 The resource follows a similar pattern, figure 3, and approaches its equilibrium at 79% of is possible maximum, faster than the church approaches its limit. It is not the limit on the effectiveness of the resource that has stopped church growth but the increasing difficulty of resource generation . Note the resource starts slowing before church, around time 10. Slowing resource generation is a sign that church growth will also slow in the near future. If none of the parameters change then a church will reach an equilibrium value – its growth limit. If any of those parameters change so does its equilibrium. If they change too much the wrong way, the church may head for extinction. 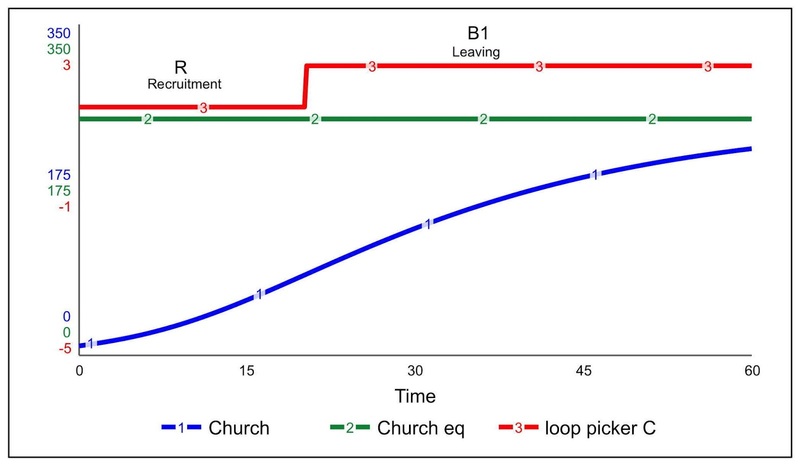 The effect of secularisation on church growth can be illustrated in this model by allowing the effect of resource on recruitment to drop as secularisation rises. This scenario reflects the increasing difficulty the church has of convincing a more hardened population to become believers. 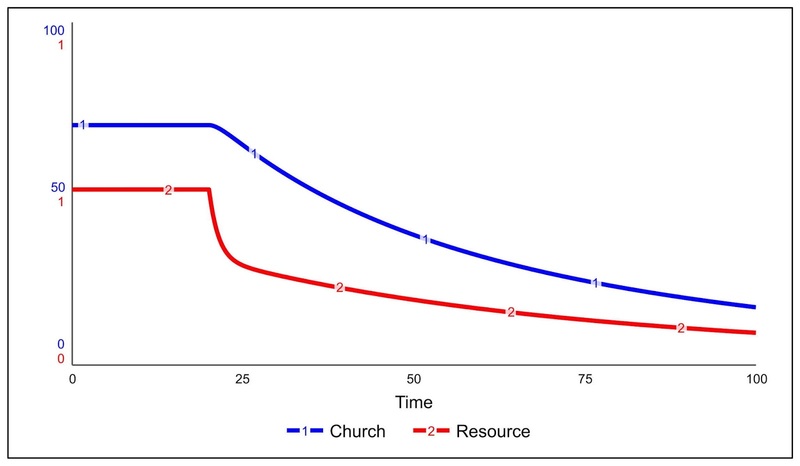 Additionally increasing secularisation also increases the rate of resource depletion, representing the pressure secularisation puts on the commitment of church members. Let a small church grow through resource generation until secularisation starts at time 45, figures 5-6. Resource growth turns to decline straightaway, figure 6, curve 1, with church following a few years later, figure 5, curve 1. The reinforcing loop R is now acting in reverse, setting the path of decline to extinction. Decline is slow. Secularisation is a very long-term effect and church numbers are always healthier than the declining “equilibrium” value it is heading towards, figure 5, line 2. There is a period of around 80 years for which the equilibrium values for church numbers and resource are still positive. If secularisation could have been halted at that point, church would stabilise rather then go extinct. It is interesting to speculate which of our current denominations are still in this phase, and which have passed to the later phase where extinction is inevitable. Short of fitting data there is no definitive answer to this, but combating secularisation is an important strategy in preventing church decline by keeping the recruitment resources of church effective . 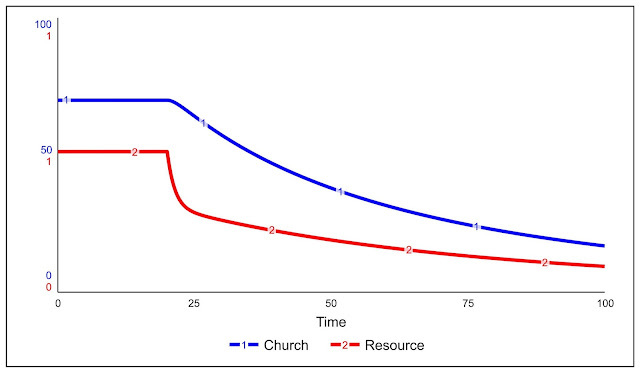 This model suggests 5 strategies that coul raise the limit the church numbers reach. 1. Fewer Resources Done Well are Better than Many Resources Done Poorly. Easy-to-generate resources with little potential to recruit should be avoided. For example a few high quality social engagement projects are better than many projects where the quality and effectiveness suffers. 2. Do Not Rely on One Resource Alone. Relying on one resource for most of the growth is risky. If for any reason factors outside the church's control affect that resource, for example the loss of a key pastor, or Sunday school teachers, then there is no alternative driver of growth. Thus two or three good resources enable a church to get through a difficult patch if one of those resources is suffering, or if secularisation renders one less effective. 3. Improve the Quality of the Resource Before its Quantity. Give due attention to improving the effectiveness of the resource. Such improvements will better aid growth than just generating more of the resource. For example a higher quality Sunday School that attracts more people is better than just making it bigger. The higher quality that gives higher church recruitment will naturally increase church size. Likewise improvements in the quality of pastoral care, the sort that people outside the church find helpful, will aid growth more than just making more care available. 4. Reduce the Leaving Rate. Closing the back door of the church always helps raise the capacity limit of the church. A lower leaving rate makes the resource more effective on net growth. Many resources deplete, people leave the church for natural reasons, leaving Bible studies, Sunday Schools, social programmes etc. But others leave due to events in the church that hurt them, hinder them serving God etc. Good pastoral care of people will help reduce this resource depletion, and of course make more contented people. As church grows the likelihood of such adverse effects on people increases and leaders should be on the look out for early signs of difficulties. For the background to soft variables in System Dynamics see the following and the references therein. Hayward J. &; Boswell G.P. (2014). Model Behaviour and the Concept of Loop Impact: A Practical Method. System Dynamics Review, 30(1), 29-57. Hayward J. (2012). Model Behavior and the Strengths of Causal Loops: Mathematical Insights and a Practical Method. Presented at the 30th International Conference of the System Dynamics Society, St. Gallen, Switzerland, July 2012. This can be proved with mathematics but I must confess I have not written up yet either in a publication or on my website. It has probably been proved by someone else in a different model. Such is science!